The 106th Rose Bowl Game presented by Northwestern Mutual will be held on January 1, 2020. The game will feature a traditional matchup of teams from the Big Ten and Pac-12. Come early and enjoy pre-game activities including tailgates, Rose Queen and Royal Court appearances, and more. The Big Ten will occupy the west sideline (press box side) and have their colors painted in the north end zone, while the Pac-12 will occupy the east sideline and have their colors painted in the south end zone. 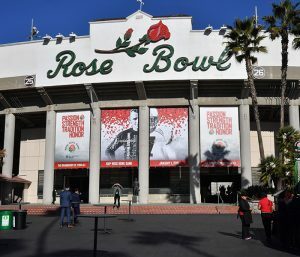 The Tournament of Roses will have a public sale for the tickets to the 106th Rose Bowl Game in December. Tickets will be available online by clicking HERE or by calling Ticketmaster at 1-800-653-8000. 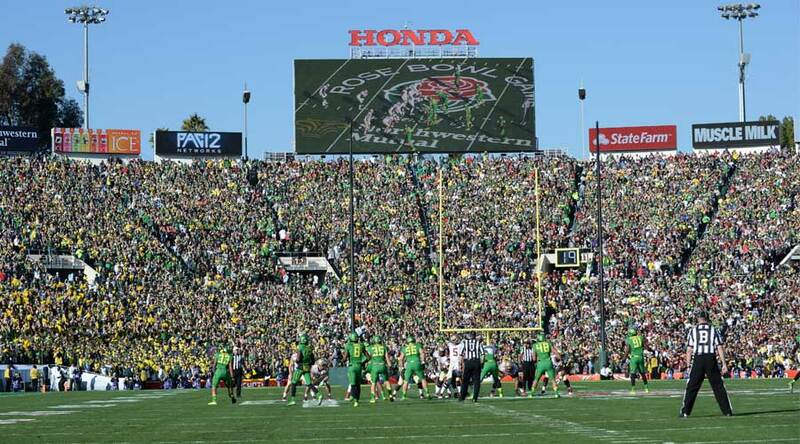 A maximum of four tickets per person will be available during the Rose Bowl Game ticket public sale. Individual ticket prices start at $160 plus Ticketmaster handling fees. Tickets will be made available for the Rose Bowl Game presented by Northwestern Mutual through Ticketmaster and PRIMESPORT. Sell your Rose Bowl Game tickets at the Official Ticket Exchange via Primesport. The Official Rose Bowl Game Ticket Exchange is the only 100% guaranteed, approved secondary marketplace. Fans who can no longer attend the 105th Rose Bowl Game presented by Northwestern Mutual may list their tickets for sale in a safe, anonymous and convenient way, and sell their tickets to fans through the Official Ticket Exchange. Please visit their website for more information. The Rose Bowl Game presented by Northwestern Mutual safety tips and guidelines can be found on our Game Safety Guidelines page. Please also visit Rose Bowl Stadium for their rules and a list of prohibited items. Safety tips and guidelines are also provided by the City of Pasadena. Modified street closures will affect Colorado Boulevard starting at 10:00 PM on December 31 through 2:00 PM on January 1. The Rose Bowl Stadium is located at 1001 Rose Bowl Dr. in Pasadena, California. Driving to the Rose Bowl Stadium can be very difficult due to general Los Angeles traffic and heavy Rose Parade and game day traffic flowing in and out of Pasadena. Please follow the driving directions in the Game Day Guide. Do not rely on GPS directions as they do not take into consideration traffic patterns or the location of the general parking lots. Please consider carpooling, using public transportation or the free shuttle service. Heightened security may also slow your entrance into the stadium. Rose Bowl Stadium Parking: General parking at the Rose Bowl Stadium is available in Lot H, 1-4, 6, and 8-10. Parking is $40 in advance and $60 on game day. Parking lots open at 4:00 a.m. Other than designated overnight motorhome parking, there is no overnight parking at the Rose Bowl Stadium. In-and-out privileges are prohibited in all parking areas. Once you exit the parking lot, you will be required to pay the full parking fee upon re-entry. More information on bus parking, RV parking, and limo services can be found in the Game Day Guide. Parking at Rose Bowl Stadium can be paid for via cash, ALL credit and debit cards, and Apple Pay. Passes can also be purchased online in advance at parkjockey.com/rose-bowl. Parsons Parking Lot: There is a $45 parking charge per car at Parsons Parking Lot, located at the corner of Union Street and De Lacey Avenue with entrances off of Walnut Street and Holly Street in Pasadena.  The Rose Bowl Game presented by Northwestern Mutual Shuttle Bus will pick-up location at the corner of Union Street and Pasadena Avenue will transport you to the Rose Bowl Stadium gates. The shuttle runs continuously from 10:00 AM until approximately two hours after the end of the game. Reserved parking can be purchased in advance through LAZ Parking for $40. Overnight parking is also available for $90. Bus parking and RV parking also available. Call LAZ Parking at (626) 578-1705 for further details. ADVISORY: Between 10:00 AM and 11:30 AM, there will be heavy traffic exiting Pasadena from Parsons Parking Lot and the adjacent Old Pasadena parking lots due to the Rose Parade. 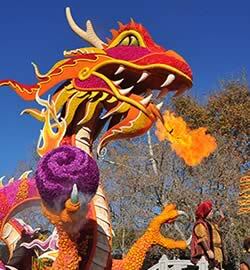 It is advisable to arrive in Pasadena before 10:00 AM or after 11:30 AM to avoid congestion. The Rose Bowl Game presented by Northwestern Mutual Shuttle: Free shuttle buses will be available at Parsons Parking Lot, at the corner of Union Street and De Lacey Avenue in Pasadena. The shuttle runs continuously from 10:00 AM until approximately two hours after the end of the game. Metro Gold Line Light Rail Service: The Los Angeles County Metropolitan Transportation Authority (MTA) operates a light rail service to Pasadena via the Metro Gold Line. If you would like to take the Metro Gold Line to the game, exit the train at Memorial Park Station in Pasadena. Follow the signs for two blocks to the Rose Bowl Game presented by Northwestern Mutual pick-up location at Parsons Parking Lot. This shuttle will take you directly to the Rose Bowl Stadium. After the game, simply reverse your route. For help planning your MTA trip, call (323) 466-3876 or visit metro.net. Drop-off/Taxi Zone/Rideshare Services: The designated drop-off, pick-up, and taxi zone are on Holly Street between Fair Oaks Avenue and Arroyo Parkway.  Passengers may take the free Rose Bowl Game presented by Northwestern Mutual Shuttle to the stadium. There are no provisions for drop-offs and pick-ups at the stadium. All taxis or passenger cars entering the Rose Bowl Stadium area will be required to pay the appropriate parking fee. Follow Rose Bowl Game on Facebook, Twitter, and Instagram for the latest news and behind-the-scenes action.  Share your posts with #RoseBowl.